It’s not uncommon for business owners to have more than one business. In the case of Pho Hong Tam, there are two with the same name; one in Athol Park and the other in Rosewater. I was rather impressed with the Athol Park store that I decided to see what their sister store was like. The Rosewater store certainly has more exposure being on busy Grand Junction Road, but the area of the store is definitely a lot smaller. The furnishings are dated and you can’t help feel a bit cramped as you maneuver yourself around the cafe. 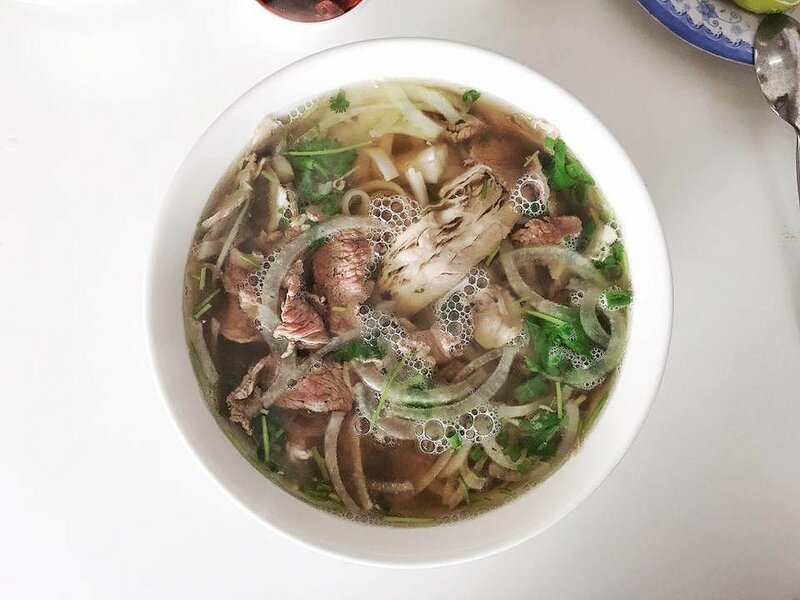 Just like the other store, there are 16 different combinations of Pho which are available in 3 different bowl sizes, as well as your rice and vermicelli noodle dishes. Like my recent visit to their sister store, I ordered the large Pho Tai Nam which is a Vietnamese Beef Noodle Soup with rare beef and brisket. The place was busy at the time so it did take a good 15 minutes for the food to arrive. The serving size was the same, and it came with all the trimmings, including the pickled white onions. The dish came to the table piping hot which is essential for cooking the raw beef slices. The raw slices were lean, however, this particular batch of brisket was rather fatty (which was not bad with boiling hot broth). The fresh noodles were well cooked, and the ratio of meat to noodles was just right. The star of the show for a Pho is the broth, and this one seemed to be watered down and lacked the essential beefiness. The flavour of star anise was present but very subtle. This cafe is really popular among the local Asian community. There was a large group of Vietnamese people as well as other customers from Hong Kong, Korea and the Phillipines. A busy cafe means there’s always fresh batches of food being cooked. One thing I did pick up on at their sister store was the cleanliness. This place wasn’t much better. There were food remnants on the seats as well as dirty cutlery. If I had to choose between the two stores, the one in Athol Park is better.